I have been delaying writing this post. I wrote about my initial reactions immediately following the event, but then have let the day sit and nestle into my heart since then. 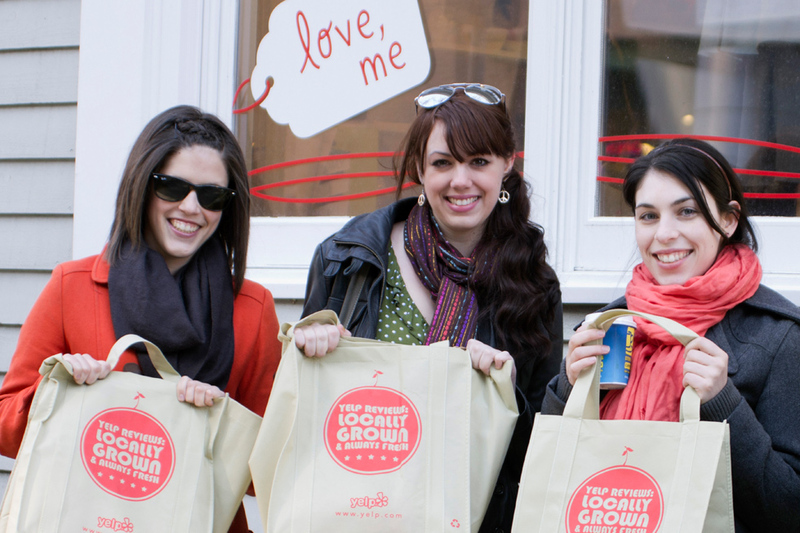 On Saturday, March 10th, Yelp Halifax organized its first ever Cash Mob. The idea is similar to that of a flash mob – people meet up to complete a task and create an event. But in the cash of a Cash Mob, the idea is to meet up and shower a local business with patronage. Participants are not told the location until minutes before they set out to ‘mob’ and the participating retailer is told with just enough time to call in some friends to help and ensure they have change in their cash drawers. To say the experience was overwhelming is too simple and not heartfelt enough. To have over 100 (joyful) people stand in line for over an hour (on the first gorgeous Saturday since I don’t know how long), has a profound effect on this shopkeeper whose business is so deeply personal. I think I will just litter this post with links (here) and photos because I have gotten to the point that I have talked about it so much I don’t want it to become over simplified. I think I will just end with a reminder: where you choose to spend your money has an effect. (And if you shop here and read my blog, well I am preaching to the choir, I know… but I feel it can never be said too much, right?) When you shop local, your dollars count. When you get to know the retailers and they get to know you, that is a relationship and that makes a community. It mattered to me that 100 people chose to support me – before they knew they were told that it was Love, Me being mobbed AND after they were told. It mattered to me that people were happy in my shop where I try really hard to create a little piece of happy. It mattered to me that people were thanking me even though I was almost in tears attempting to thank them. It mattered to me that Yelp and others wanted to help me because they see that my wee shop has something to offer. This does not happen in a box/chain stores. Big chains don’t make an effort to remember your name. They don’t care about what you spend your money on. They don’t thank you for realsies when you shop in their store. You are not going to be able to Cash Mob everyone you would like to. You are not going to be able to shop local and independent all the time. But your choices matter. Where ever and whenever you can make them. OK? What I can’t show you is the amount of Twitter traffic #yelpcashmob generated that day. It was the highest trending topic in NS and fourth for Canada. Shut the front door!! Blessings and love to all ya’all.